While it may not be up to the standards of Robert Louis Stevenson, there's still much to enjoy in this treasure-seeking Paramount swashbuckler that supplements its lively action with plenty of double dealing and a hint of romance. The underrated John Ireland gives a bullish performance alongside Forrest Tucker and Richard Arlen as stranded soldiers of fortune, who steal Emile G Meyer's ship and cross the South Seas to Australia in search of buried loot. 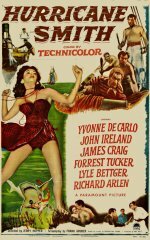 However, fake scientists James Craig and Murray Matheson are also after the booty and Ireland's fate lies in the hands of the latter's half-Polynesian daughter, Yvonne De Carlo.